Tampines Rovers FC are one of the older professional football clubs in Singapore, having been formed in 1945. 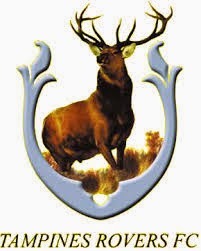 Throughout the 1950’s and 1960’s ‘The Stags’ competed in the Singapore Amateur Football Association League. As one of the top clubs in the league, Rovers progressed to Division Two of the National League in 1974 upon its formation. Promotion to the top level after just one year, the same season in which they went down 1-0 in the Presidents Cup Final at Jelan Besar to Singapore Armed Forces Sports Association in front of an incredible gate of 30,000. National League titles arrived at Tampines Stadium in 1979, 1980 and 1984 before they suffered a relegation. However they won the Division Two title in 1994 as Rovers were invited to join the S. League. Under Thai coach Vorawan Chitavanich, Tampines won the S. League and Singapore Cup double in 2004. They defended the title successfully and became the first Singapore side to win the ASEAN Club Championship. Another national cup was added to the trophy cabinet in 2006 before local coaches Steven Tan and then Zulkarnaen Zainal led the side to further S. League wins in 2011 and 2012 as legendary striker Aleksandar Đurić led the line. 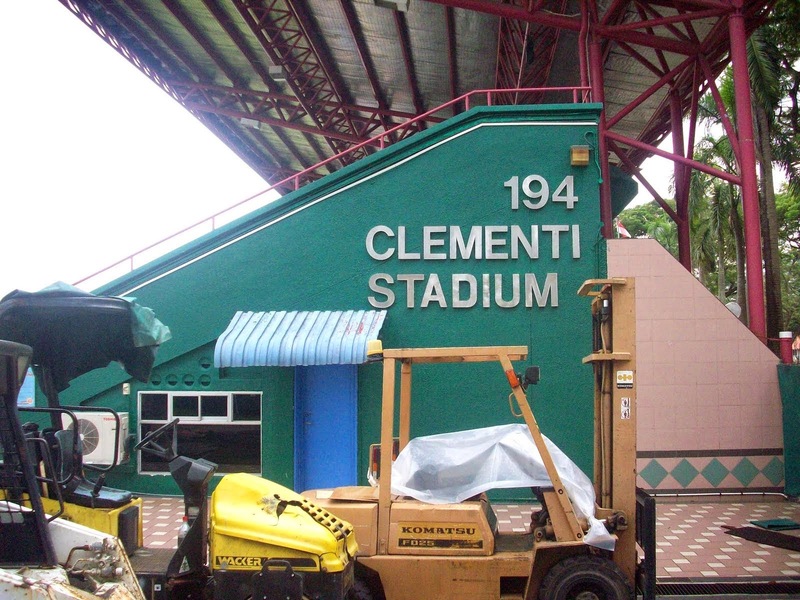 The club had to decamp to Clementi Stadium at the other side of the island as Tampines Stadium was demolished to make way for a brand new Sports Hub to serve the community. A fifth S. League title was collected by The Stags in 2013 under the tutelage of Tay Peng Kee. At the end of the 2014 season Đurić hung up his boots at the age of forty four. Tampines Rovers will play in the S. League in the 2015 season. My day visiting the stadiums of the S. League was taking its toll as I’d underestimated the heat and severe humidity in Singapore. Tampines was the fourth club of the day as the SMRT system had taken me the length and breadth of the island. Following my call in at Warriors I had taken the bus to Choa Chu Kung station. However, I fancied a nice rest so when I saw that a bus passed within a hundred yards of my intended destination I sat back and relaxed. The route went a lot further than I anticipated but it was lovely to sit back and see parts I wouldn’t have otherwise including seeing a small raised monorail system joining many of the housing schemes. I alighted at a stop on a motorway labelled ‘Aye’. I thought I was back in Yorkshire! 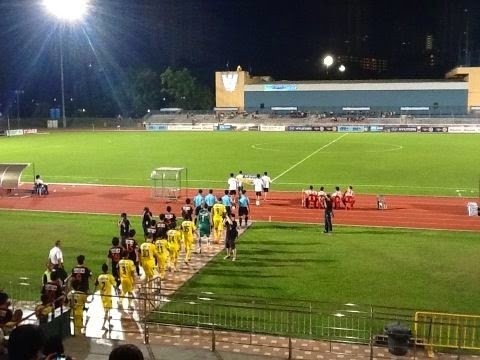 The footbridge over the carriageway offered a great view of Clementi Stadium, which had a long traditional main stand and open seating opposite, with an athletics track surrounding them lush green playing surface. The rest of the arena was flat and open. Like all venues, the club had a small presence by way of offices and a small clubroom. 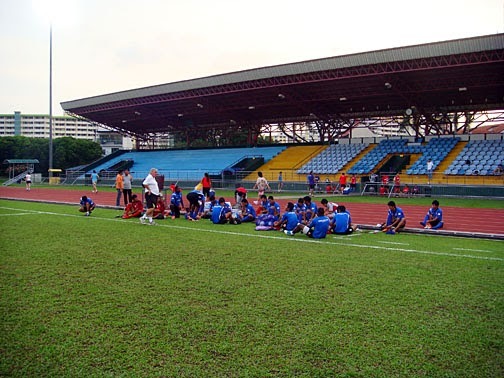 The stadium had previously played as home to Home United and Tanjong Pagar United since it had been opened in 1983. Once done I decided to cut through the housing estate, which had lots of seating and community facilities, but thankfully, no vandalism or graffiti. It really did make a nice change. The old ladies serving me my sun block and drink in the local supermarket epitomised almost everyone I’d met. They smiled and offered excellent customer service. They were genuinely delighted when I told them what a good place they lived in. I went upstairs and took the train onto my final destination to the west of the city, the home of the time of Tanjong Pagar United.